“And the LORD went before them by day in a pillar of cloud to lead them along the way, and by night in a pillar of fire to give them light, that they might travel by day and by night” (Exodus 13:21). On 25th January 2011, Kabwata Baptist Church clocked 25 years as an independent local church. I wrote a blog on that occasion stating that we had almost missed the occasion due to the “over forty” syndrome. The church leadership, however, determined that some time in the course of the year, time should be taken to commemorate this important milestone in the church’s life. That occasion finally came this month. We dedicated two Sunday evening services (5th and 12th June) to our Silver Jubilee and ended the commemoration with an afternoon’s event last Saturday, 18th June 2011. It was truly a fitting crescendo. One of our elders, John Kumwenda, opened the celebration by sharing with us from Exodus 15 about the joy that Moses, Miriam, and the Israelites experienced at God’s great deliverance from Pharaoh’s Egypt. He then exhorted us to also spend the time in God-honouring thanksgiving for his goodness to us especially in the last five years. 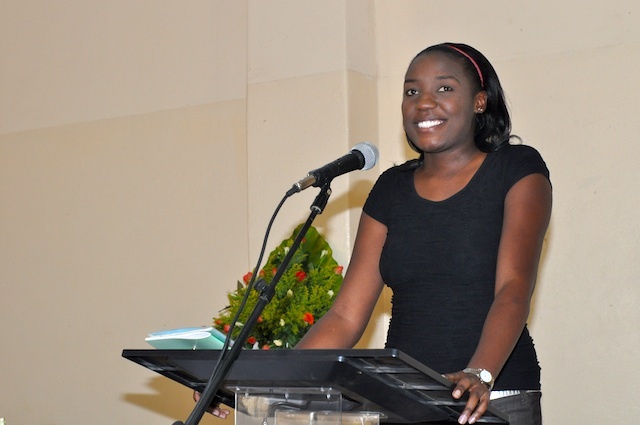 Patience Namangala: "These have been the best years of my life!" 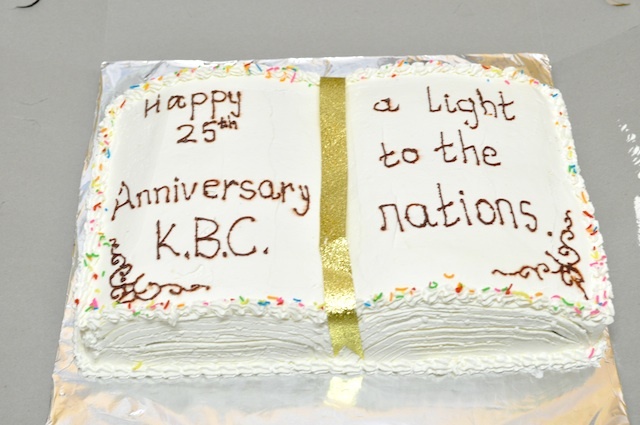 On the previous two evening services when we commemorated this event, we had one member (Mmamulatelo Siame) and one deacon (Kasango Kayombo) sharing with us about their experiences in being members of KBC in the last five years. On this final day, we had Alexander Mwilambwe (a teacher with the church school) and Patience Namangala (the pastor’s office assistant) sharing with us their experiences in working at KBC. Alexander talked about how he had learnt to work hard and to see teaching as a ministry to children and not just a means of getting an income. Patience talked about her initial plans to just work at KBC for a few months and move on to greener pastures, but has been so blessed in the period she has worked at KBC that she now wants to remain as long as possible. “These have been the best years of my life,” she said. Apart from congregational singing, which centred on God’s faithfulness, various groups sang special songs to the congregation. 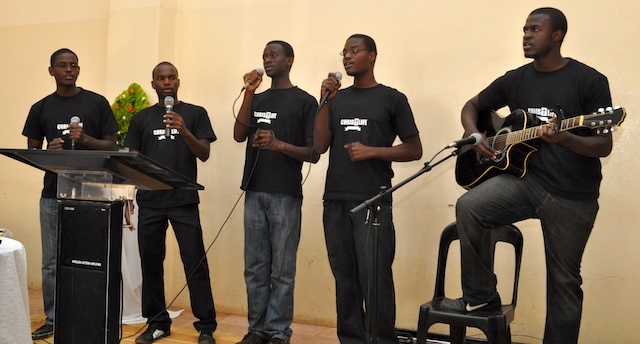 These included “Christ Life”, the KBC Music Ministry, the Chisomo Baptist Church musical ensemble (which was just assembled together in the last one week, specifically to sing on this occasion), etc. Other groups were nameless, but their singing really ministered to our hearts. One of our members, Noel Konga, interviewed the elders of the church. 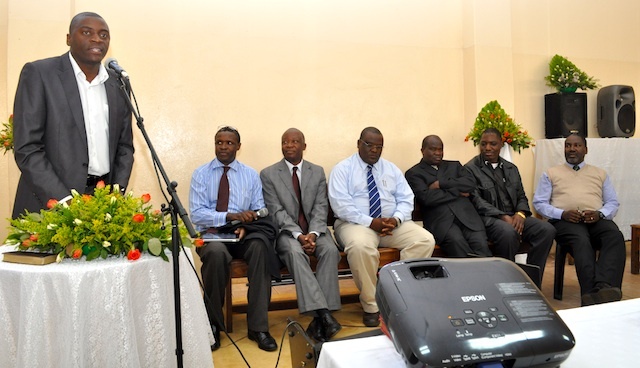 Only Pastor Chipita Sibale was missing from the panel, as he had to attend to some family duties. We all introduced our families and ourselves for the sake of our new members. Then there were questions related to how we managed in our busy work schedules, how we ensure spiritual oversight over our families, whether those of us who have married off our daughters observed African cultural norms, etc. The next interview was done by one of our elders, George Sitali. He interviewed our church’s ministry leaders. After the ministry leaders introduced themselves, they explained a little about how their ministries differ from other ministries in the church. The ladies ministry was asked about their greatest challenge and their greatest joy. Monde Mulunga, the ministry leader, talked about the challenge related to their outreach at night to prostitutes (which is dangerous) and the joy of seeing some of these women baptised and coming into membership in the church. Another challenge was finding another form of livelihood for these women who were now converted to Christ and so could not continue their nocturnal fundraising activities. Some of the other questions asked were: How do new members of the church find themselves in your ministries? When will the Music Ministry produce the next CD? 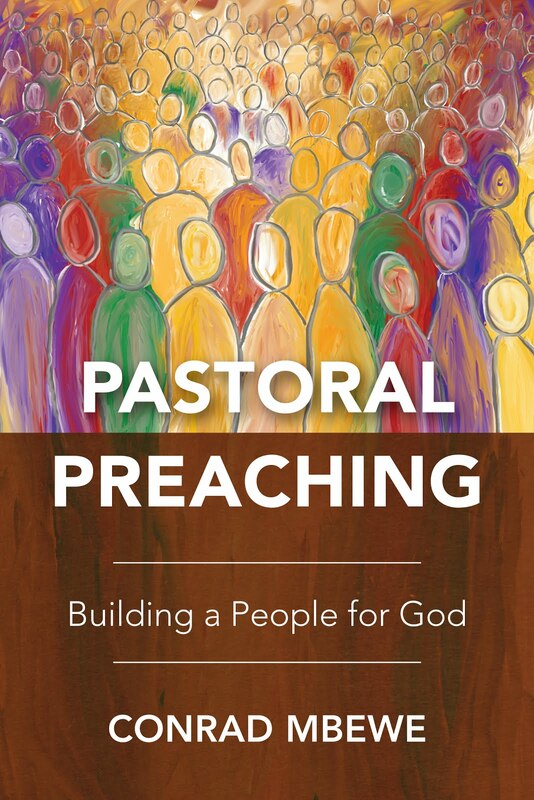 Do ministries go to minister among the churches being planted in the mission field? What is your greatest challenge in leading your specific ministries? 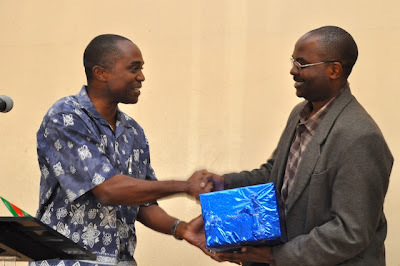 The chairman of the deacons, John Chundu, gave a token of thanks for exceptional hard work to Ivor Chilufya, the deacon in charge of finances. With KBC having over 400 members, about 40 employees, about 15 active outreach ministries, about 20 mission stations, etc., keeping the finances of the church flowing smoothly has been no small task. Hence, at our last members meeting in May, the members expressed appreciation for Ivor’s hard work. The church officers decided to seal this with a commemorative award, which was a Swiss cuckoo clock. Since this was not a common practice, one of the elders, Mwamba Chibuta, gave the biblical rationale for tokens of thanks being given when people are still alive—instead of only praising them when they are dead. Another commemorative award was the naming of the church guesthouse. It was named “The Kennedy Ndui Guest House”. Kennedy Ndui was a single young man who joined KBC soon after he graduated in Civil Engineering at the University of Zambia. He was with us for just a few years, and during that time he spent almost all his free time from work on our church construction site when we were putting up the pastor’s house and the church auditorium. As it turned out, his was the first wedding to take place in this building, and his was also the first funeral to take place in the same building. Hence, Kennedy holds a very special place in the hearts of KBC’s members. 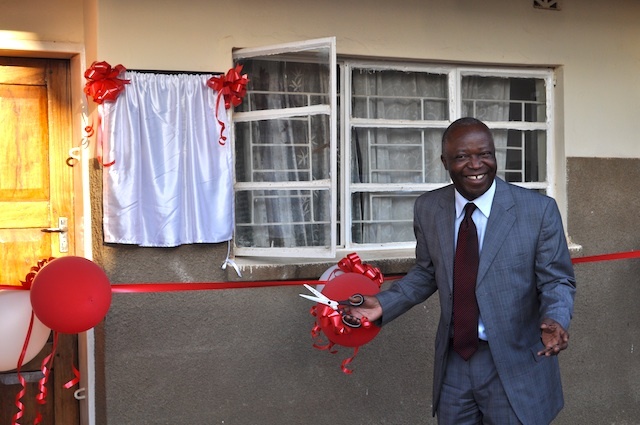 Mwamba Chibuta, led in the unveiling of the plaque. One of our elders, Eric Sinyangwe, read Numbers 19:15ff. I then gave a brief exhortation from Exodus 13:21-22, entitled, “The Privilege of being led by Fire and by Cloud”. My main points were that “the cloud and fire” stood for God’s direction, God’s provisions, and God’s presence with the people of Israel. 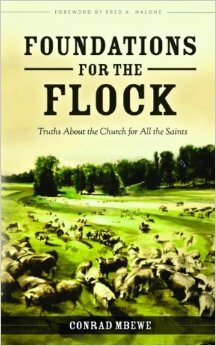 This was also a great treasure for us as individual Christians and as a church as we “travel” towards heaven. After the sermon, the meeting watched a PowerPoint presentation on various aspects of the church. 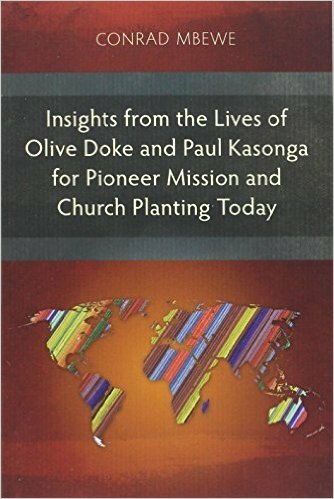 Whereas on the previous two occasions, we had presentations on the church’s membership, meetings, and ministries, this time it was on the church’s work of missions, our church officers, staff, and interns, and our inter-church activities. The photos were those taken in the last five years, in line with our emphasis for this event. 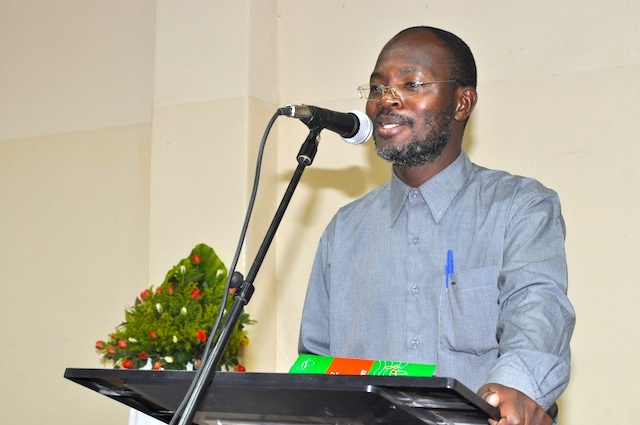 Lichawa Thole: "Leave vernacular church planting to us." One of our former missionaries, Lichawa Thole, gave his testimony about how the Lord has dealt with Chisomo Baptist Church (the church that God used him to plant) in the recent past. He stated that one of his greatest joys is that the current elders were all converted at Chisomo Baptist Church. He also stated that now that a number of vernacular churches have been planted, KBC should leave the planting of vernacular churches to the vernacular churches that have already been planted. He also expressed gratitude to God for the provision of land between Matero and Chunga for them to put up their church structures—which they had begun to do in earnest. Adamson Shamfuti, one of the current three pastoral interns at KBC, gave the final testimony. Having spoken about his conversion and call to the ministry, he talked about how he trained for the ministry and came to the Reformed Faith while in training. Finally, he shared about how he came to KBC as an intern and how rewarding he has found working at KBC as an intern. He was most grateful to the church for paying him while he worked as an intern, which enabled him to look after his family. George Sitali closed the meeting in prayer soon after 18.00 hours. The Music Ministry sang, “Through the Fire”, as we left the auditorium. We thank God for his goodness to us as a church for the last 25 years. We also thank all of you who have stood by our side as we have laboured for the gospel in our neck of the woods. To God alone be the glory—great things he has done. Amen! Amen. I rejoice to not only hear KBC proclaim the glory of God but that by the providence of God He allowed me to be part of it during my internship there. And I can tell you that the work of God in and through KBC did rub off on me. May you continue to always abound in the work of the Lord.